The Repatriot U.S. Outdoor Flags are constructed of 100% Recycled #2 Plastic (milk jugs and soda bottles). 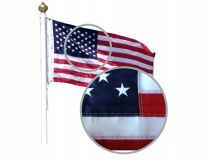 It has the same feel and texture as our nylon U.S. flags with the same 6-month guarantee. This is the flag of the future. 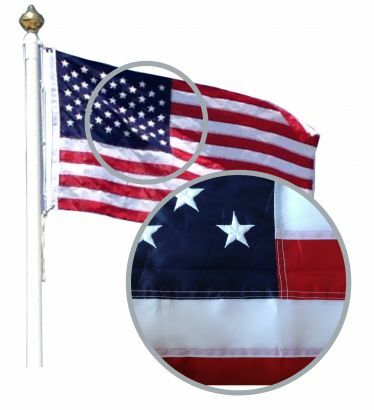 It's strength is comparable if not slightly better than a nylon U.S. flag, yet its ability to retain it's color is significantly superior to EVERY nylon or polyester flag you can purchase anywhere. We offer this flag at a loss, so you the consumer will try it. At some point, demand will drive the costs down further where it's a sustainable product, but in the meantime we will price it to gain your consideration. The Repatriot Material will eventually replace current materials once the market realizes its advantages. The development of this new American flag was spearheaded by Sam Russo, a veteran serving two combat tours in Afghanistan. Much of the proceeds Sam's company receives, goes to veteran outreach programs. We support and are proud to be involved with Sam and the good works he's doing for our country and our veterans. Recycling and Patriotism go hand in hand. Here is a link to the Repatriot Flag site where you can learn more about Sam's Vision and his veteran organization partners.